The First Capital Chorus (FCC) has been based in Langley, BC, for over fourty years and has grown to over fifty members from all walks of life. The FCC, a member of the Barbershop Harmony Society, provides local area men with the opportunity to belong to a group of like-minded people for fellowship and the enjoyment of music. Many of the FCC members have no formal musical training but all enjoy the four-part, a cappella harmonies of Barbershop singing. The chorus also has several performing Quartets within its numbers. The chorus rehearses weekly in Langley in order to maintain and improve the skill levels of the membership and to educate those members who are new to Barbershop singing. Our music repertoire is quite extensive with new songs arriving on the scene on a regular basis. Many volunteer hours are given by the members during rehearsals, home practice and preparation for shows and sing outs. The FCC Board of Directors is comprised of a very active group of members who spend many extra volunteer hours in the day-to-day operation of our fine organization. We regularly offer this wonderful singing ensemble at various events throughout Langley and the surrounding communities. We provide sing outs as requested by various community organizations to provide entertainment for their events. Such events include Langley Canada Day Celebrations and entertaining at seniors facilities. Our audiences are very appreciative of the quality of the shows that the chorus presents. We are always striving to increase this audience base by producing “bigger and better” concerts for their enjoyment. The chorus competes annually at the regional level within the Evergreen District and at a local level in Evergreen District's Division I. We have won music awards and international recognition for our charitable contributions as well as praise from the thousands of people who have enjoyed the Chorus’ inspiring shows. 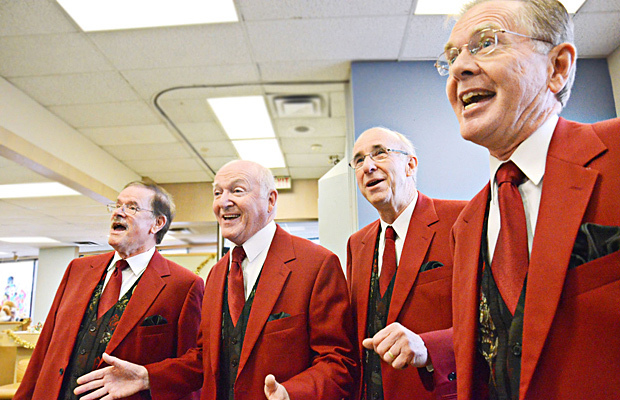 The chorus organizes and presents annual fundraisers including Remembrance Day and Christmas shows. The Christmas Benefit show, a fundraiser for the Langley Christmas Bureau, is always very well received. To date, funds raised for the Christmas Bureau total over $100,000. The First Capital Chorus is proud of its efforts at raising money through public musical performances to help sustain the chorus and to benefit local charities. The First Capital Chorus invites local young singers to a workshop at very low cost to help promote singing in the community. Langley's mayor Peter Fassbender , has praised the chorus for showing up to provide entertainment at events sponsored by the city such as the recent Langley Days a few month ago when the chorus was literally " singing in the rain". Synchromesh presenting a cheque from chorus fund raising and singing.